No word from RIOC if additional Tram service will be made available. The directors who abstained made it clear that they were not objecting to Ms. Indelicato qualifications for the RIOC President/CEO position but were objecting to the process by which she was selected without an Executive Search by the RIOC Board and without competing candidates. The Resident Directors who voted to approve Ms Indelicato also objected to the process by which she was selected but asserted that on balance the urgent need for a permanent RIOC President coupled with her qualifications outweighed their concerns over process. More on Ms. Indelicato's selection as RIOC President from previous post and will update with more video from the meeting tomorrow. and statement by former Roosevelt Island Residents Association (RIRA) Secretary Sherrie Helstien expressing her disappointment and shame at the two resident RIOC Directors (Howard Polivy and Fay Christian) who voted "lock step" to approve Governor Cuomo's selection of Ms. Indelicato without the appropriate vetting of her candidacy. Before the vote during RIOC's Public Session, Roosevelt Island's Assembly Member Micah Kellner expressed disappointment at the lack of transparency in the selection process of Ms. Indelicato by Governor Cuomo. Mr. Kellner also spoke of the lack of trust existing between the Roosevelt Island community and Public Safety Department and the need for reform of the Department. 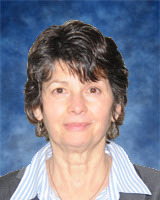 As reported yesterday, among the items on today's Roosevelt Island Operating Corp (RIOC) Board of Directors Meeting Agenda is the appointment of Charlene Indelicato as the new RIOC President/CEO. Also, prior to the start of the RIOC Board Meeting there will be a Public Session where members of the Roosevelt Island community can address issues of concern to the Board of Directors. Members of the Roosevelt Island Residents Association (RIRA) Public Safety Committee are expected to ask the Board about progress regarding the investigations of brutality allegations leveled at the Roosevelt Island Public Safety Department during today's Public Session. UPDATE 10 PM - The RIOC Board voted to approve Ms. Indelicato today by a vot of 5 in favor and 3 abstentions. More here. Ben Kallos is running to succeed Jessica Lappin as New York City Council Member for Manhattan's 5th District which includes Roosevelt Island and the Upper East Side. Last week, Mr Kallos sent the following letter to Roosevelt Island's Assembly Member Micah Kellner who is also running for the same NYC Council Seat. I am writing on behalf of the residents of Roosevelt Island to suggest changes to legislation you authored, New York State Assembly Bill Number A.956 to create the New York State Civilian Complaint Review Board to investigate alleged misconduct by police and peace officers that you originally introduced as A.10618 on April 12, 2010. I need not explain to you the importance of this bill you are sponsoring on behalf of our community. It is disappointing that our government has not responded to residents’ consistent complaints regarding the conduct of the Public Safety Department and that our campaign may have been the first to bring these larger issues before the New York State Inspector General for their investigation. These alleged abuses have continued for the past three years, while the only legislation to address them has sat in committee with no other action taken. Force a Committee Vote on Your Legislation. Assembly Rule IV §5(b) allows a Sponsor of legislation to force a vote in committee. When this legislation was first introduced in 2010 it did not make it out of the Codes Committee and when it was reintroduced in 2011-12 it remained in the Governmental Operations Committee without an online record of a vote each time. Please use this power to force a committee vote immediately. Force a Vote of Your Legislation on the Floor of the Assembly. The New York State Constitution Article III §18 empowers Assembly Members to collect signatures from two-thirds of legislators to force the legislature to convene an “extraordinary session” where they must vote on the legislation on the petition. Please use this power to force the legislature to make the legislation we need to protect Roosevelt Island residents. Author Legislation Narrowly Tailored to Serve Our Community. Roosevelt Island residents are requesting a CCRB for the Public Safety Department of the Roosevelt Island Operating Corporation, but your legislation does not call for the creation of such a board. The current legislation creates an unnecessary bureaucracy duplicating the role of the Inspector General that is already statewide in nature. Please either introduce a twin bill that is narrowly tailored or amend the existing bill to solve the problem in question by creating a board with sole jurisdiction over the Public Safety Department. Either narrowly tailored legislation or introducing two versions of the same legislation with one narrowly tailored and the other broadly tailored will mean a greater chance of success. Public Hearing and Solicitation for Improvements. Many of the changes below could have been identified prior to or immediately following the legislations introduction by holding of public hearings or through use of online transparency tools like those found at KallosForCouncil.com. Please hold public hearings on all of your legislation and submit it for public comment online and in person. Create a CCRB Specifically for Roosevelt Island Operating Corporation Public Safety Department Not for Police Statewide. The legislation seeks to create a CCRB for all police departments and peace officers throughout the State of New York. However, Roosevelt Island is only seeking a CCRB for the Roosevelt Island Operating Corporation Public Safety Department. The legislation must be amended or twin introduced that is narrowly tailored to address the specific problems on Roosevelt Island. Require the Appointment Roosevelt Island Residents. The legislation seeks to appointment nine (9) members without mention of residency. All nine would be appointed by the Governor, with six appointed on the recommendation of the Attorney General, Comptroller, and legislative leaders. The problem here is that the legislation centralizes appointment power in the very Executive branch from which residents seek protection. Please model on the CCRB by requiring all appointees to be residents of Roosevelt Island with geographic diversity related to housing complex. Appointments should include the Senator, Assembly Member, and City Council Member representing the Island along with allowing direct election. Include Experienced Law Enforcement Professionals Just Like the CCRB. The legislation specifically excludes the service of anyone with experience as a law enforcement professional while the CCRB appoints three out of thirteen who do have experience as a law enforcement professional. There is a role for individuals with experience as law enforcement professionals on a CCRB. Require Cooperation by the Roosevelt Island Operating Corporation Public Safety Department. The CCRB requires cooperation by the police department and its commissioner in all complaints, investigations, and reporting. This requirement must be included in the legislation. We have already filed what we believe may be the first and only formal complaint with the New York State Inspector General and are going to supplement it with additional evidence we have collected. We hope an investigation will end abuses and create an oversight body of residents to prevent their recurrence. I offer my support to you to get this legislation passed on behalf of the Roosevelt Island community, especially at this moment of concern, when it is so crucial that everybody works together for the sake and safety of our community. This letter will be circulated to the Roosevelt Island Community Coalition, Roosevelt Island Residents Association as well as its Public Safety Committee, and finally online at KallosForCouncil.com/share/public-safety-stories where we are soliciting community feedback, suggestions, and support. As such, further amendments are likely to be submitted. We respectfully request: (i) an immediate public hearing on your legislation, (ii) amendment or introduction of twin legislation to keep the Roosevelt Island community safe, (iii) an immediate vote in the Assembly Committees, and (iii) an immediate vote on the Assembly Floor. I have a real record of results for the Roosevelt Island community. I will continue to work tirelessly to rebuild trust between the residents and the public safety department. I appreciate Mr. Kallos' new-found interest in Roosevelt Island issues. While many of his suggestions demonstrate a fundamental misunderstanding of the statewide civilian complaint review board proposal -- as well as the legislative process -- I will give his comments all the consideration they deserve. More on Assembly Member Kellner's statewide civilian complaint review board proposal at this previous post. Mr. Kallos spoke yesterday at the Roosevelt Island Residents Association (RIRA) Common Council Public Session. Mr. Kallos reported that he sent a letter urging Governor Cuomo to appoint the most recently elected RIOC Board nominee candidates Larry Parnes and Lydia Tang to the vacant RIOC Board seat formerly held by Sal Ferrera. Mr. Kallos noted that his letter was published by the Albany Times Union Capital Confidential which is read by Governor Cuomo. ... former RIOC Director Jonathan Kalkin, who was replaced by Sal Ferrera, was the winner in an earlier (February 2012) RIOC Director Nominee election before both Mr. Parnes and Ms. Tang. RIRA member Frank Farance told Mr. Kallos that he did not think having Roosevelt Island residents as Board members was of prime importance but having competent Board Members whether residents or not was imperative. Here's what Mr. Kallos had to say at yesterday's RIRA meeting. As previously reported, there is an ongoing insurrection/rebellion/dispute between factions of the Roosevelt Island Garden Club (RIGC) as to who is the President of the organization, whether the October 2012 election of April Ward as President was valid pursuant to their bylaws and how the RIGC should be managed. The issue was discussed during the Roosevelt Island Operating Corp (RIOC) Operations Advisory Committee (audio webcast here at approximately 58 minute 30 second mark) on Monday and the Real Estate Advisory Committee (audio webcast here at approximately 39 minute 30 second mark) yesterday. I will have more on what happened during these meetings later but the bottom line is nothing was resolved regarding who is in charge of the RIGC, whether the RIGC permit will be renewed by RIOC and if renewed, under what circumstances. Ms. Ward sent the following announcement regarding a RIGC meeting tonight. Come! Say hello to other members, have a snack and chat while checking out our progress on issues you brought to our attention. YES, even in the middle of an attempted insurrection, we continue to work for you! Please come prepared to write your questions for officers on a card, to be answered during the President's address or during the question and answer period after the meeting. If you have attended garden meetings before, well, this is a plant of another color. All people are welcome and because we are obligated in our bylaws to adhere to Roberts Rules of Order, all behavior is not. It is the Chair's duty to adhere to the Rules of Order which protect the assembly from abuse and waste of time. My goal is to have everyone depart with a happy feeling, thinking of the new plants they will grow this season. Please let me know whether you will attend the Spring meeting or not so we can plan for food and chairs. The air and soil are slowly warming - Spring has arrived! 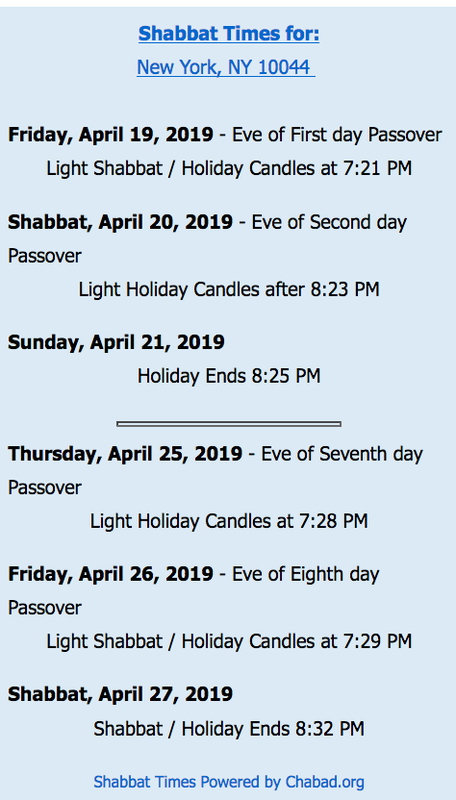 If only on the calendar, certainly in our minds we are not too far from our individual and collective efforts to plant and grow the gifts of the garden. While our permit for the garden has expired and the garden is closed, it’s time to meet and organize our committed members to re-invent the Roosevelt Island Garden Club, LTD. If you are a member (and whether you have your own plot or not, if you paid your dues this year, you are! ), I hope you will attend this meeting. In addition to so many things we need to plan for the coming season, there are three important matters that we as a club need to address. 1. We need to establish effective governance, to ensure that RIOC allows us to continue to use the community garden. 2. We need to engage and organize the associate members so that they can form a border committee and create a beautiful, cohesive border garden. This is important because in our permit for the community garden, RIOC specifically says that we need to have a flower border. 3. We need to ensure that all members are engaged, and that their rights are protected. I understand that all this work around club governance is not why you're a garden club member, but the fact is that we are an organization that needs to ensure that coming to the garden is enjoyable and safe for all members,and that we are able to do the things that RIOC asks us to do in the garden permit. I look forward to your participation on Wednesday so we can sort all this out, convince RIOC to reopen the garden for us, and start planting! The following is the President’s report to our membership. 1. New weeding tool options will be at the Membership Meeting. 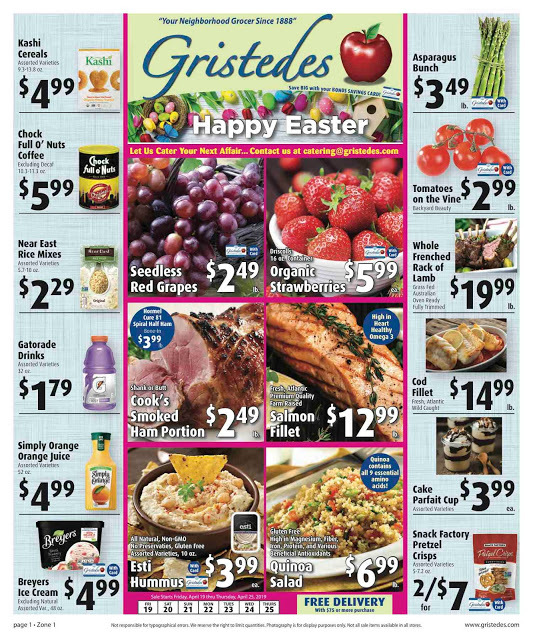 Take a look and let us know what you think of them. 2. Locks – The center gate has a new padlock on it until we decide on new lock sets and keys. When the garden opens, use the two side gates. 3. We found a source for bagged organic compost!! This will be good for most any soil and won’t have the weed problems we had last year. You can sign up for soil, compost, manure and other yummy soil amendments at the meeting. Your soil will love you! 4. Website – research on our new website has begun! There will be a suggestion sheet at the meeting or you may write to us. If you are familiar with a garden website you’d like us to model ours on, let us know which one it is. 5. We found the old Roosevelt Island Garden Club logo and it is being cleaned up for use on the website and letterhead! You can see it at the meeting. 6. We will start recycling this year and new landfill trash procedures will be in place to reduce donations to landfill. 7. Roosevelt.Island.Garden.Club@gmail.com remains our email address. Some unhappy members are sending emails and letters to some of you stating that, even though I was elected President by your overwhelming vote at the Fall Membership Meeting in October, they think I was not elected President "similar to electing a president of the United States who is not a US citizen." How laughable! As you know, I am a US citizen, resident of Roosevelt Island with a family and a dedicated friend and member of your community and Roosevelt Island Garden Club. Rest assured I will not abandon my commitment to you and my acceptance of your trust in me as your president. The so called self created "Executive Board" are not a recognized or authoritative group and have no legal standing or power to run anything in the Roosevelt Island Garden Club, LTD. You should regard any direction from them as null, void and of no legal effect. 8. Community Composting is coming to our garden! We will be able to turn most of the clippings into black gold for everyone. 9. Jim Bates from the Disabled Association is now working with us to match people with available plots. 10. I went to a gardening intensive at the New York Botanical Gardens and will share some of what I learned in an upcoming email. 11. Some members mentioned wanting to go on field trips. We can borrow the Boy Scouts' van and options will be announced at the meeting. Yesterday, several death threats were phoned into my New York office in response to news reports about a bill I authored requiring gun owners to have insurance. The calls were fielded by young interns, who were understandably shaken by this experience. I am proud of my work to help curb gun violence. I strongly support the comprehensive package of gun reforms proposed by the Obama Administration and I have authored two common sense pieces of legislation aimed at keeping our communities safer. One bill would put some teeth in the law against gun trafficking and straw purchases. Another would require that gun owners carry liability insurance, just like car owners, to give innocent victims of gun violence some recourse if they are injured. 100,000 Americans are injured by guns every year. Carrying insurance is the responsible thing to do. Given all the acts of gun violence we have seen in the past two years, the shootings in Aurora and Newtown, the attack on my friend and colleague Gabby Gifford, I take the threat of more gun violence very seriously. But it is not something that I will allow to stop me from doing my work. 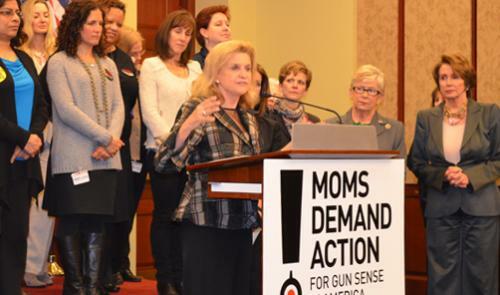 Click here for the entire Daily Caller article and here's more from Congresswoman Maloney on background checks for gun owners with NBC's Chuck Todd. Click here for the rest of the NY Post article. For a complete description of Bill A2113, please click here or see below. Enacts a Duty of Faithful Public Service: Incredibly, there’s no such duty on the books today. The Joe Bruno scandal showed what a glaring hole this is. If we want to eliminate the culture of corruption, we need a law that makes clear that public officials must serve the public first and foremost. Punishes Corrupt Schemes to Defraud the Government: Currently, the law only punishes schemes to defraud government agencies of property, services, or resources. The PCPEA expands the crime of defrauding the government to punish any and all corrupt schemes involving public servants and others who seek to corrupt the operation of government in any way. Reforms Criminal Bribery Statutes: The bill takes action to ensure that bribery of apublic official is punished just as seriously as completed bribes, and it makes sure that public bribery is treated in the same way as bribery in the private sector. Reforms the Member Item Process: The bill creates new standards and prohibitions for community projects grants, which are commonly known as “member items.” Among other protections, it stops lawmakers from funneling taxpayer money into shady nonprofits that don’t even provide real services, but in which they or their relatives have a financial interest. Enhances Financial Disclosure for State Officials: As it stands, the clients that legislators represent in private practice are hidden from public view. While this makes sense in a few instances — such as when the clients are involved in family court cases, where they have a reasonable expectation of privacy — there’s no reason why most of lawmakers’ private clients shouldn’t be disclosed, just as they are in other states. This bill will allow the public to monitor the sources and values of outside income earned by our elected officials. Strengthens Campaign Finance Rules: Up until n ow candidates have legally been allowed to get away with disguising loans intended for campaign use as personal gifts—allowing them to circumvent campaign contribution limits. This bill closes that loophole. Here is the text of the PCPEA. WNYC's Brian Lehrer show discussed the corruption allegations. Here's what was said. Republican mayoral hopeful John Catsimatidis just put out the following statement confirming that he cooperated with authorities in a federal case alleging that GOP officials and operatives -- including one of his own employees and campaign advisors, Vince Tabone -- tried to use bribes to get Democratic Queens state Sen. Malcolm Smith a Wilson-Pakula to run on the party's line in the primary. "The arrests this morning point to a culture of corruption that permeates the politics of our city and state. Corruption that is fueled by career politicians who put personal advancement before public service," said a statement from the billionaire candidate's campaign. Click here for the entire NY Daily News Daily Politics post. 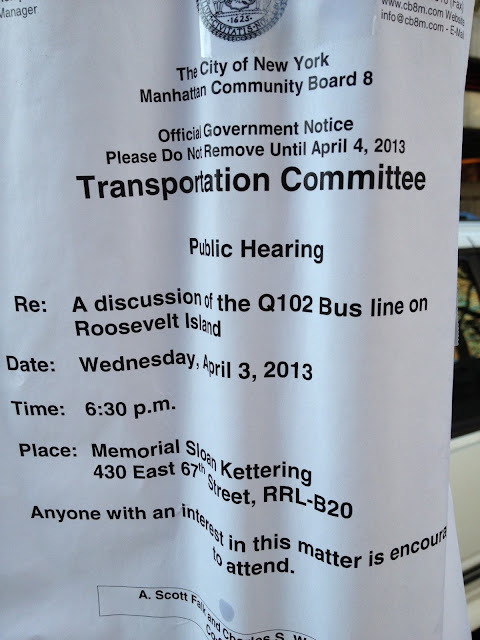 Q 102 Roosevelt Island Bus Service On Agenda For Community Board 8 Transportation Committee Wednesday Night - What Would You Suggest To Improve Q 102 Bus Service? I am preparing a post for Roosevelt Islander Online regarding the Q102 CB 8 discussion. Could you tell me what the purpose of the Roosevelt Island Q 102 discussion is about? Larry informed me that he thinks it has to do with the Q102 service schedule (long waits) on Roosevelt Island. Is that true? 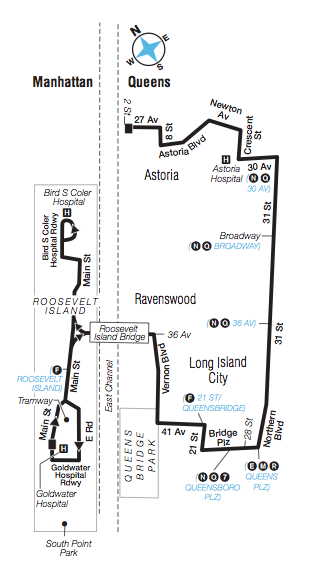 Several Roosevelt Island residents have discussed with me the desirability of changing the Q102 bus route so that it travels down Vernon B'lvd to Jackson Avenue which would connect Roosevelt Island to the Long Island City commercial corridor. Is this route change part of the discussion and if not, can it be? Some resident complaints regarding long rush-hour waits for the Q102 were brought to my attention, and CB8M added this to our agenda to see if we could help. We don't specifically plan to address the rerouting that you mention, in that this rerouting would take place outside of our district, but we expect to have New York City Transit reps at the meeting -- and I certainly wouldn't discourage the R.I. residents from expressing any such suggestions while they have the ear of NYCT. The CB8M full-board meeting for April is scheduled to take place on 4/17 at Manhattan Park's Theater Club, so that will also provide additional residents the chance to speak during our public session, but there is no expectation of any NYCT representative to be present (and thus this Wednesday may provide the best chance for NYCT to hear directly about the complaints and suggestions). Wednesday's CB 8 Transportation Committee meeting will be held at MSK-Rockefeller Research Laboratories 430 East 67th Street (First-York) Room RRL-B20 starting 6:30 PM. Here is the current route of the Q 102 Bus. 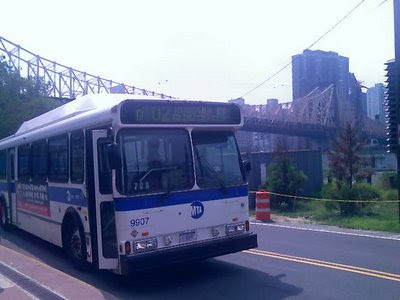 Instead of turning on Vernon and 41st Avenue, the Q 102 could continue down Vernon to Jackson Avenue in LIC and then to Queensboro Plaza connecting Roosevelt Island to the heart of Long Island City. 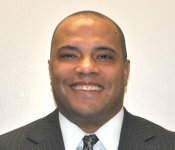 We are profoundly saddened to announce that Frensheria D. Michael, an officer of the Roosevelt Island Public Safety Department, passed away on Sunday, March 31. Officer Michael served with the Public Safety Department since August 2, 1999 as a Patrol Officer, and had been a certified member of the department's Bicycle Unit since August 14, 2006. She served the community with honor, dedication and pride. During her tenure, she received a Meritorious Service Award and an Exceptional Merit Award. She was also scheduled to receive a Life Saving Medal. Officer Michael quickly earned the respect and admiration from all her fellow officers as well as members of the Roosevelt Island community. She was gifted with patience, and was often seen on Main Street, speaking with senior citizens and young folks in particular. Officer Michael was a wonderful person and a very professional officer. She will be deeply missed. I often saw Officer Michael on Main Street. She was always quick with a smile and a hello. Condolences to her family and colleagues. UPDATE 4/7 - Officer Michael's funeral will be on April 8. PLEASE TAKE NOTICE that a meeting of the Real Estate Development Advisory Committee of the RIOC Board of Directors will be held on Tuesday, April 2, 2013 at 5:30 p.m. at the RIOC administrative office, 591 Main Street, Roosevelt Island, New York. including removing of Arcade windows, very soon. 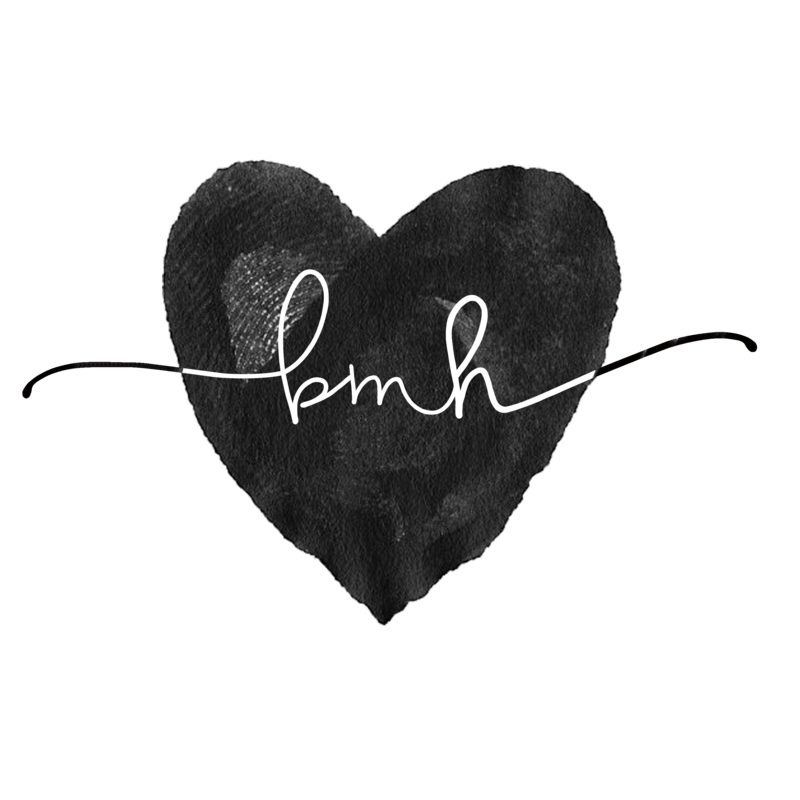 Hopefully, we will get more information tomorrow. Do you have an interesting experience, photo, link or video to share? How about a problem to fix, compliment to give or just something you want to vent on and get off your chest about living on Roosevelt Island? You set the Agenda. 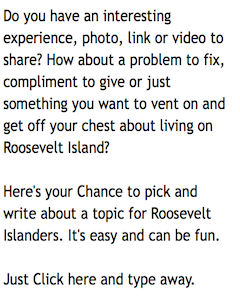 Your Chance to pick and write about a topic for Roosevelt Islanders. It's easy and can be fun. Just click on the comments link and type away. 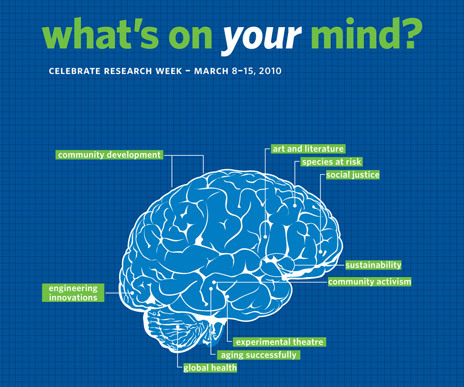 UPDATE 10/18 - Starting a new What's On Your Roosevelt Island Mind thread. Please post any new comments at this link.